Hello! Are all sample questions for pro or associate level of exam? Its regarding question 23 can you please explain possible modifications that cloud watch alarm and cool down timers can do in this case that reduce cost and preserve elasticity. scaling activity is triggered before the new instance gets a chance to handle traffic. Can you clarify why increase desired and not maximum ? it’s a future load , so i thought that maximum would be better to manage the load without paying for not used resources. as much as i understand that desired is the number which Auto Scale will reach even if the not needed. Key point in the question is proactively, so you should set desired to build up the instances beforehand. When you delete an Auto Scaling group, its desired, minimum, and maximum values are set to 0. As a result, the Auto Scaling instances are terminated. Alternatively, you can terminate or detach the instances before you delete the Auto Scaling group. Thanks, there is a correction to the statement. Question 17 I think the answer is B. The question asks how to ensure scalability between the application and SQS, so private subnet and EBS optimized makes sense. Your answer, D, answers a different question around how to scale based on queue size. Scalability between SQS and Application can be improved by the Application being able to handle millions of messages. Having instances in private subnet with EBS optimized would not improve the handling capacity of the EC2 instances. EBS–optimized instance provides additional, dedicated capacity for Amazon EBS I/O but not with SQS. EBS optimized takes EBS disk traffic off the main network interface, leaving more bandwidth for SQS. The question asks for the best bandwidth to both sending and receiving – option D is just for receiving and doesn’t help sending at all. However of course SQS bandwidth scales linearly with the number of instances, but again D is all about receive and doesn’t mention sending. I checked the cloud guru forums, and it’s 3 votes for B, 4 for D, but the moderator voted for B. So it’s one of those tricky questions. I guess the question is which answer is least wrong, as none are quite right. The best answer is probably EBS optimized to help provide bandwidth for sending along with scaling the processing instances based on queue size, so a combination of B and D.
Questions like this are why 2 minutes per question is tricky. Agreed, its always tricky for these kind of open ended questions, where its open to interpretation. Professional is quite intensive to for time for sure, so unless very well prepared it can get very tough. Thanks for publishing such a useful blog. Could you please explain answer to question #1? Why answer is A and not C? As per AWS documentation even End time and recurrence value is not required. The question is not about optional and required. But what parameters are valid which is causing the confusion. Refer to Auto Scaling AWS documentation. I can see that you can create scheduling event way into the future .. why does the recommendation has to be wait till end of november? why not do it now ? Any thoughts from you ? The date and time that the action is scheduled to begin. This date and time can be up to one month in the future. When StartTime and EndTime are specified with Recurrence , they form the boundaries of when the recurring action will start and stop. I tried this just now. I am able to set the start time to be 1st Dec 2017. Today is 9th Oct 2017. Can you please throw some light on this: “This date and time can be up to one month in the future.” ? At the link mentioned by you, the aforementioned quoted statement is mentioned in the output of the describe-scheduled-actions command. Is it the case of document defect where the doc has not been updated when previously such a limitation was there? is the answer still valid? Seems to be still. Refer the AWS documentation. I am able to set up a scheduling event daily at 9AM starting from Aug 1 – Aug 31. Also a scheduling event weekly on monday starting from Aug 1 – Aug 31.
with different min, max , desired capacities. In this case there will a conflict on every monday. But I am allowed to do it. from my observation it complained only when the start date and time of the two scheduled events are the same. It did not seem to mind the intersect that happens during the time period they were set up. Any thoughts from you ? Pleas eIgnore this .. as long as the times conflict in the period aws is not allowing to save. You have a great blog and great set of questions probably batter than any other paid content. Thank you for such an effort. I should have thanked you in the first post itself. I have never used aws CLI / API. so may be I am missing some thing very fundamantal here. to delete ASG why not use the delete autoscaling command instead of setting desired capacity to zero ? As all the instances needs to be delete before and the other options are not valid. To terminate all instances before deleting the Auto Scaling group, call update-auto-scaling-group and set the minimum size and desired capacity of the Auto Scaling group to zero. Could you please say opinion about practise questions on Braincert.com. It seems architect level than associate. Kindly share your opinion on this. Does we really need in depth knowledge as sampled in those questions to complete the associate exam ? Practice questions on Braincert are Associate level, professional level practice exams are much more complex, longer in prose and almost always involve multiple AWS services in the solution. If my database server crossed threshold value (ex. CPU reaches 92% but my threshold value is 80%) how can I troubleshot the issue. you can look into the monitoring stats and you can also check the logs to check the slow, long running queries. You can configure alerts to notify you when it reaches 70% or 80%, so that you can check at that time. Which AWS services are Self scalable by default ? I know Lambda is self scalable (You do not have to scale your Lambda functions – AWS Lambda scales them automatically on your behalf). Can you provide any such AWS services that are auto scalable and doesnt’ require any configurations? The other service I am thinking is SQS ( Amazon SQS can scale transparently to handle the load without any provisioning instructions from you). ELB, DynamoDB are auto scalable. ELB scales automatically as per the demand. DynamoDB with auto scaling will scale automatically. API Gateway scales automatically. Most of the Custom AWS managed services (Not RDS as there is underlying DB) should scale automatically. Please could you advice for the below question. meet this criterion, one will be randomly selected. C. Send an SNS notification, if configured to do so. D. Terminate an instance in the AZ which currently has 2 running EC2 instances. E. Randomly select one of the 3 AZs, and then terminate an instance in that AZ. Correct answer should be C & D as Auto Scaling would select the AZ with most instances as per the default termination policy and send notification through SNS. If you suspend AddToLoadBalancer, Auto Scaling launches the instances but does not add them to the load balancer or target group. If you resume the AddToLoadBalancer process, Auto Scaling resumes adding instances to the load balancer or target group when they are launched. However, Auto Scaling does not add the instances that were launched while this process was suspended. You must register those instances manually. minutes after the first instance is launched will Auto Scaling accept another scaling actMty request? With multiple instances, the cooldown period (either the default cooldown or the scaling-specific cooldown) takes effect starting when the last instance launches. Thanks for the great blog. I have a query on below statement.. The above holds true when we trigger using SDK? because, using AWS console if i set Min = 2 and Max=12 and if the scale out policy defines to increase 100% when cpu>60, in this case when first policy triggers it’s 2×2, second policy 4×4 and when third time policy triggers it will add 4 evenly balancing between AZ’s. Please let me know if my understanding is correct. Its for the desired capacity which cannot exceed the maximum in all cases. I believe right answer to Q18 will be Autoscaling group. When you select AS group, it enables to drill down to instance details, stop instance and change instance type. Q18- You have decided to change the Instance type for instances running in your application tier that are using Auto Scaling. In which area below would you change the instance type definition? If you have not created Launch configuration, then yes you can do it from Auto scaling group. Congrats Mugunthan, thats a great score. For question:32 could you please advise if the answer should be “Entering Standby” rather than Pending. The question is emphasizing on “After leaving steady state what is the first state”. EnterStandBy is the state before StandBy. The state after StandBy is the Pending. Option C is 15 running always and 5 for scale up/down hence its not cost effective. the operation is fault-tolerant up to the loss of one Availability Zone. Which is the MOST cost-efficient way to meet these requirements? Deploy two instances in each of three Availability Zones. Deploy two instances in each of two Availability Zones. Deploy four instanes in each of two Availability Zones. Deploy one instance in each of three Availability Zones. B, but Application B should be denied from making request to Application A. 1) Which is the SIMPLEST solution to achieve this policy? 2) Using security groups that reference the security groups of the other application. 3) Using security groups that reference the application servers IP address. 4) Using Network Access Control Lists to allow/deny traffic based on application IP address. 5) Migrating the applications to separate subnets from each other. Option 1 should work fine using Security groups for the instance launched by auto scaling. Q#4 , As per your below statement, it will error out if you try to change the health of the instance using CLIs. Isn’t it so ? For an unhealthy instance, the instance’s health check can be changed back to healthy manually but you will get an error if the instance is already terminating. Because the interval between marking an instance unhealthy and its actual termination is so small, attempting to set an instance’s health status back to healthy is probably useful only for a suspended group. Q#6. I think answer should be Option A. 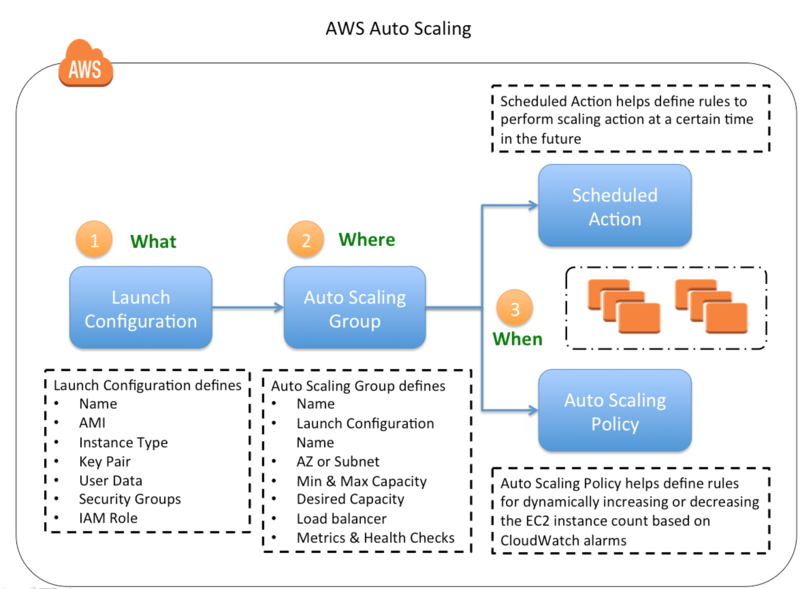 Auto Scaling launches a new instance first and then terminates the unhealthy instance. The scaling process launches new instances in an unaffected Availability Zone before terminating the unhealthy or unavailable instances. AZRebalance terminates instances only after launching the replacement instances. Could you please enlighten me how Option D would be the right answer. For AZRebalance. I agree it is A. For this question, this answer should be D.
Amazon EC2 Auto Scaling creates a new scaling activity for terminating the unhealthy instance and then terminates it. Later, another scaling activity launches a new instance to replace the terminated instance. ARRebalance happens when a scale in event happens. For an health check failure, it would terminate the instance and launch a new one. To maintain the same number of instances, Auto Scaling performs a periodic health check on running instances within an Auto Scaling group. When it finds that an instance is unhealthy, it terminates that instance and launches a new one. Indicates whether terminating the instance also decrements the size of the Auto Scaling group. thats right. The command line params have undergone quite a lot of changes.